Mr. 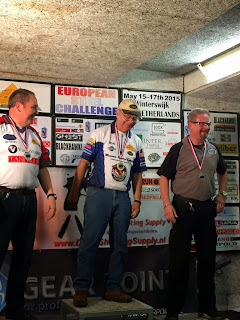 Completely: European Steel Challenge 2015 Mr. C. Strikes Gold! European Steel Challenge 2015 Mr. C. Strikes Gold! Well, it was a hectic trip spanning just barely 7 days, but it was certainly well worth it! of the 7 days I spent 2 1/2 days traveling by planes, shuttle buses, hotel airporter buses, trains, and cars. 3 days were spent at the match in Winterswijk, Holland, and a day and a half spent in De Lutte, Holland hanging out and visiting with Hans and Jolanda Wigger, the owners of Dutch Firearms Trading. the European Steel Challenge Championships are unusual in that the entire match is shot at an indoor shooting range which happens to be under the clubhouse, bar, offices, and lounge. this stage is resemble the traditional steel challenge stages but are narrower and in some cases farther out to the plates. With the exception of outer limits, all of the stages are very very fast. On Friday morning I shot my Tanfoglio 9mm. Open Division gun, but unfortunately I had to use the ammunition that I was able to purchase in Holland due to the limitations on the amount of ammunition that you can carry on the airplane. We sighted in the Tanfoglio the afternoon before the match with ammunition that we thought was identical to what I would be using in the match. It turns out it wasn't even close and the gun wasn't shooting groups, it was shooting patterns! It was almost 16 inches high compared to what it had been cited in with. On the close in stages I could keep them on the plates and ran some very acceptable times, but on the 35 meter stages it was nearly impossible to hit anything! Even so, I did well enough on the close stages that I was still at least in the middle of the pack at the end. Nonetheless, it was pretty much a disaster! Later that afternoon I shot my Taurus 8 shot open division revolver for the 1st time in a big match. I had only been shooting revolver for a few weeks prior to the match, so I wasn't expecting any great scores, as I was shooting the revolver primarily as a learning experience. Of course, it was fun too! My main goal with the revolver was to not embarrass myself or the dead last, and I manage to accomplish just that. The next morning at 8:30 AM I was scheduled to shoot my new High Standard Victor .22 pistol. I had only received the new High Standard a few weeks before the match, and I had been very busy incorporating all of the little changes and tweaks that I have developed over the years to make a very good pistol even better for speed shooting competition. The High Standard ran beautifully for the entire match. On a steel match that is only 6 stages long, one bad stage can damage your score so badly that the remaining 5 stages cannot make up for the damage. For that reason you need to shoot every stage slightly on the conservative side but not too much, or your overall time will end up to slow. That was my game plan, and I stuck to it through the entire match, and it went exactly as I had planned. I had no missed plate penalties all day. after I had finished shooting open rimfire, I was through shooting for the day and for the match. I could then spend the rest of Saturday and all day Sunday watching the other shooters show me how it should be done! 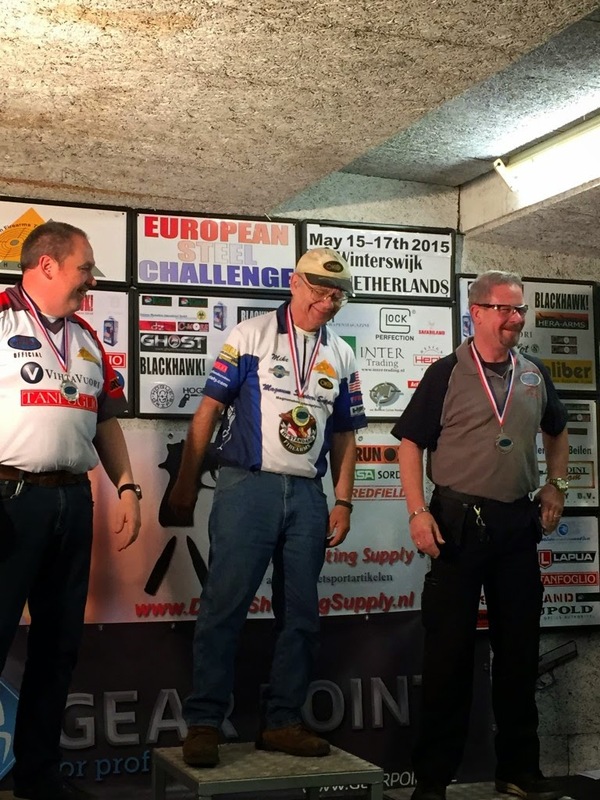 At this match we had approximately 250 entries and shooters from 13 different countries entered. There were a lot of very good shooters there to watch! On Sunday afternoon all the shooting was completed, the scores were added up, and the trophy ceremony began. At the start of the ceremony I was invited up to the stage and was given a special award that was a custom-made wooden shoe that was in appreciation for the help and support that I have given to the match over the years. It was very cool! I won't go through all of the results except to mention that KC Eusebio was the top guy overall, and Tori Nonaka was the top lady. I was surprised to find that I was the top Rimfire Senior for the match! 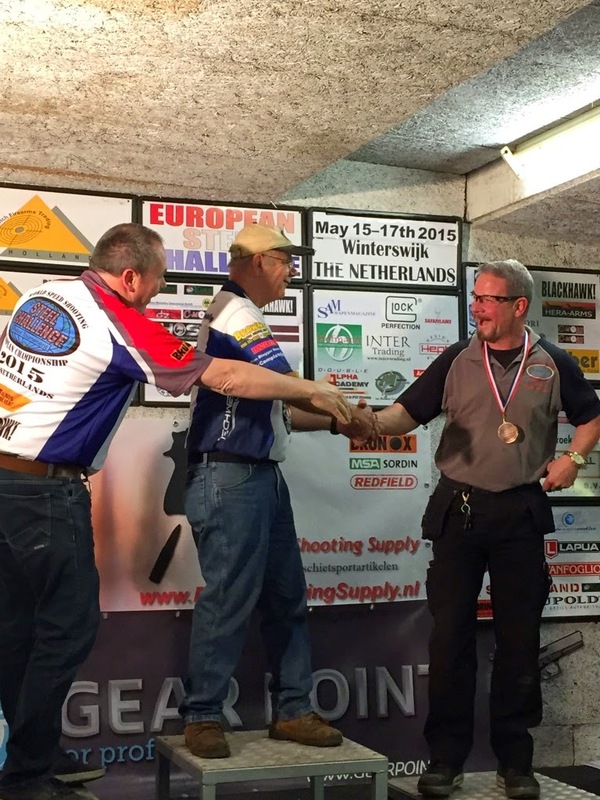 in the rimfire team event team "The Other Guys", comprised of me, Andre Hartelman of Holland, and Hubert Scheper from Germany has managed to come in third for a bronze medal. What makes that especially cool is that we are all 3 seniors! Hans Wigger, me, and Andre Hartelman, 2nd, 1st., and 3rd. rimfire senior division. Think we're having fun? Darn right! The Rimfire Teams. Yes, that's KC Eusebio in the front. After dinner several of us went to a steakhouse for dinner. I If you like Dutch apple pie, you should try 'Dutch' Dutch apple pie! Yummm! It was a very long flight in an uncomfortable seat and a crowded airplane to get there and to return, but in spite of that, it was well worth it.I hope that by next year we will have the ammunition figured out for the Tanfoglio, and I will have had the time to put in some practice hours with my open revolver too. Of course, I also need to keep practicing with my high standard Victor and hopefully have a good result next year too! I can hardly wait until next year's European Steel Championships! I was there at the ESC2015 on Sunday only, so I didn't see you shoot, but hopefully I will be there next year also on saterday so I can shoot with you. In Holland we say: Hartelijk gefeliciteerd, Mr. Completely :). Greetings Lucien & Karin. Congrats on a job well done, in spite of the obstacles!